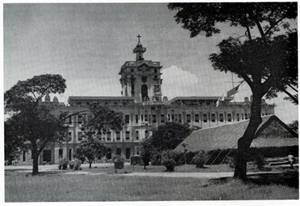 The Holy Name Society, a confraternity entrusted to the Dominican Order, was first established in the Philippines on November 13, 1930 at the University of Santo Tomas, Manila by Rev. Fr. Silvestre Sancho O.P. then Rector of the University. The University was the premier home of the Holy Name Society until the break of Second World War. The first President of the Society was Mr. Manuel Colayco; he died during the liberation of UST in 1945. On April 21, 1950, the Episcopal Commission on Catholic Action granted the Confraternity the official mandate to operate as a National Catholic Action Organization. Rev. Fr. Jesus Castañon O.P. was appointed National Promoter and Ramon C. Salinas, then a student of the university was the first National President, and later became a Dominican Priest. From here on, the Holy Name Society Parish Unit Organizations, which were subsequently organized into Diocesan Unions under the Reverend Diocesan Directors appointed by their Bishops, proliferated in the Philippines . On April 21, 1952 , Fr. Pedro Tejero, O.P., was appointed National Promoter. He convened the Reverend Diocesan Directors appointed by their Bishops and the Diocesan Union Presidents of the HNS. On August 2, 1953, His Excellency Bishop Vicente T. Reyes held a meeting with all the Archdiocesan and Diocesan Union officers and spiritual director to organized a governing body and elect there offices. A constitution and by-laws was made and approved for the National Electorate. The first officers of the National Directorate were Mr. Teotimo Roja, President, Mr. Jose Feria, Vice President, Mr. Antonio C. Delgado, Treasurer and Mr. Serafin Guingona, Secretary. On September 15, 1958, Rev. Fr. Jaime N. Boquiren, O.P., was appointed National Promoter of the HNS by Fr. Silvestre Sancho, O.P., the Prior Provincial of the Holy Rosary Province . He held the position until he retired on April 30, 1968. In 1996 he was reappointed as National Promoter and remained in this position until he retired in 2006. With 20 years of service, he became the longest serving National Promoter of the National Association of the Holy Name Society in the Philippines . The Dominican Fathers who were former National Promoters: Fr. Pedro Traquena, Fr. Rogelio B. Alarcon, Fr. Francisco Mendoza, Fr. Larry Faraon, Fr. Ramon C. Salinas, Fr. George Moreno, and Fr. Reynaldo Adalid. The current National Promoter Rev. Fr. Edgardo Alaurin, OP was appointed and took over as National Promoter in May 2012. The following have served as HNS National Presidents since 1953: Atty. Teotimo Roja, Atty. Bagasan, Judge Candido Villanueva, Engr. Octavio Q. Nicolas, Judge Leonardo Afable, Judge Rodolfo Toladano, Judge Ulysses Salvador, Mr. Francis Lagman, Judge Emmanuel S. Flores, Engr. Manuel De Guzman, Mr. Bienvenido Pentinio, Bro. Conrado Mataga, Bro. Emiliano A. Aberin, Atty. Jimmy Pablito, Bro. Manny Aguilar, Bro. Felix Tobillo, Bro. Laureano Culala, Jr. and Bro. Apolinario Carandang. The current President is Bro. Maximo Viola who was elected on January 2017. Promotes the honor and glory of our Divine God and the personal sanctification of its members by acts of love and devotion to the most Holy Name of Jesus. The spiritual life of its member is a perpetual act of reverence and love. Promotes respect for the Holy Name of God, faith in the Catholic Church and the Magisterium, loyalty to one's country and respect for all lawful authorities both civil and religious. The members are encourage to perform the Corporal Works of Mercy: to feed the hungry, to clothe the naked, give drink to the thirsty, shelter the homeless, tend the sick, visit those in prison, and bury the dead, as well as perform the Spiritual Works of Mercy: to convert sinners, instruct the ignorant, counsel the wayward, comfort the sorrowing, bear adversity patiently, forgive offenses, and pray for the living and the dead on a parochial, diocesan, and national levels. Blessed be God, Blessed be His Holy Name. the Holy Catholic Church believes and teaches. by the regular practice of my faith. justice and happiness for which it stands. O sacred Name of God's own Son. be Thou our strength until life's war is won. Sweet Name of Jesus, in Thee is our might. chilled by the storms of greed and strife. threat'ning our altars and the Nation's life. fought for the faith, forever the same. and we shall conquer in the Holy Name. Devotion to the Holy is most ancient, going back to the beginnings of the Old Testament. The second commandment of Decalogue enjoins reverence to the Name of God. In the New Law, our Lord taught us to pray that God's Name might be hallowed everywhere and St. Paul said that at the Name of Jesus every knee should bend in heaven, on earth and under the earth (Philippians 2:10-11). The institution of the Holy Name Society as a Confraternity of the Church may be traced back to the thirteenth century. At the Fourteenth Ecumenical Council held at Lyons, France, in 1274, the Council Fathers resolved to openly profess, honor and institute a special devotion to the Holy Name of God and Jesus Christ, to repair the damage wrought by Albigensian heresy and other enemies of the Church. On September 20, 1274, Pope Gregory X, the reigning Pontiff, issued the Papal Brief "Nuper in Concilio" directing Blessed John of Vercelli, the Master General of the Dominican Order, to instruct all members of the Order of Preachers to fulfill with greater zeal the will of the Pope for the propagation of the devotion by rendering honor and reverence to the Holy Name of God and Jesus Christ, His Beloved Son. Their efforts were rewarded by the spread of the devotion through Europe. With the impetus provided by Blessed John of Vercelli, the devotion became widespread. In 1432, in Lisbon, Portugal, it started to assume an organizational pattern. To stop an epidemic of a plague that was then ravaging Lisbon, a saintly Dominican Prelate, Andre Diaz, urged the people to put their trust in the power of the Holy Name of the Savior and to enroll themselves in a society which should labor to make the Name of Jesus loved and honored by all. Soon the city was freed from the dreaded disease. On January 1, 1433, the new Society of the Holy Name was born. And through it, the people assembled to give thanks to God for their deliverance. Statutes were drawn up and the Feast of the Circumcision was made the principal feast of the Society. The Second Sunday of the month was made the Sunday meeting of the Confraternity. In 1450, another Dominican Friar named Didacus of Victoria founded another confraternity. This time he named it the Society of the Holy Name of God. Its aim was to suppress blasphemy and profanity in ordinary and everyday conversation. A constitution was also drawn up for the purpose. After more than a century in existence, or to be exact on April 13, 1564, the Society was extended official recognition as a Confraternity of the Church by Pope Pius IV when he merged Bishop Diaz' confraternity with that of Fr. Didacus. Pope Pius IV commanded all ecclesiastical authorities to favor the organization and by it granted indulgences for certain practices and devotion of members. Later Popes of the 16th and 17th centuries further enriched it with many more indulgences, both partial and plenary. The first unit of the Holy Name Society in the United States was established shortly after American Civil War and the first archdiocesan union was organized in New York City in 1882 after several parochial units joined forces at the initiative of the parish unit of St. Vincent Ferrer. Units of the Society were also erected in the Diocese of New York and Brooklyn. The Archdiocese of San Francisco followed shortly thereafter and through Father Charles Hyancith McKenna, OP., also called te "Apostle of the Holy Name", permission was granted by Pope Leo XIII on May 20, 1896, to establish the Holy Name Society everywhere in the United States where the organization might receive the approval of the local Ordinary. The Society, being a Confraternity of the Church, has been established through Papal letter entrusted to the Order of Friars Preachers (Dominicans). This is the reason why the source of canonical authority for its establishment in any parish must come from the Master General of the Order. With unswerving devotion, the Dominican Fathers exerted their best to put into fruition the original desire of Pope Gregory X, as communicated to Blessed John of Vercelli. Now who was this man, Blessed John of Vercelli, OP and what did he do? He was born John Garbella around 1205 near the city of Vercelli. The son of a dairy farming family, had lots of land, sheep and the wool from the sheep was turned into "wealth" of one form or another. 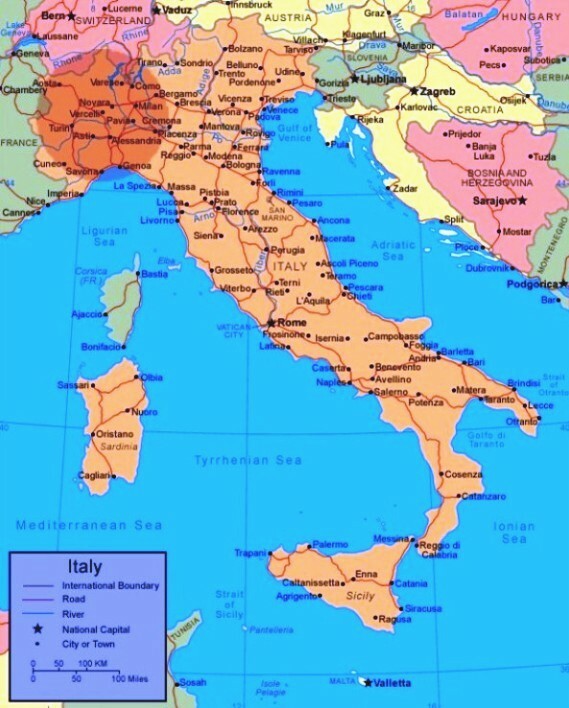 Vercelli is approximately 350 miles north of Rome and just about equally distant between Milan and Turin. Above the city of Vercelli on the side of the mountain is a town called "Mossa Santa Maria" and above the town is a hamlet called "Cappa Mostro" and this is where John Gabrella was born. John Gabrella received his education in the school right next to the Church at he bottom of the mountain where the city of Vercelli is located. He was a student of University of Paris at the age of 14; by the time he was 25 he had received his Doctorate of Civil and Canon Law. It was a delayed vocation to the religious life. He left Paris and started a school in Vercelli. He taught school and met Blessed Jordan of Saxony, who was then a dynamic Dominican preacher. He received John Vercelli into the Order of Preachers. 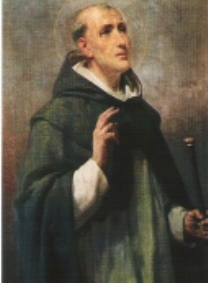 It was Saint Dominic who founded the Order of Preachers in 1216. He recruited Blessed Jordan Saxony in 1221. Blessed Jordan was 30 years old when he was received into the Order, just two years before St. Dominic died. Blessed John Vercelli became the 6th Master General of the Order. He has been given the credit as the founder of the Holy Name Society. Coming from the Northern Italy, he was rather short in stature with a pointed chin and blue eyes. He was known to be lame, some would say that he was crippled, had a limp on his right side or would use a walking stick while walking barefoot everywhere he went. The back part of his walking stick is a relic shrined in New Orleans and the remaining part of the walking stick is in a monastery in Vercelli, Italy. He was credited for the saving the writings for St. Thomas Aquinas. He was known to be obedient to the popes of his time. Lord Jesus, You made Blessed John an apostle of Your Holy Name and a great peacemaker. Grant the favor we now ask through his intercession and if it be Your will, honor Blessed John by numbering him among the saints of your Church. AMEN.